The breakup of a family can have an enduring impact on children. But as Dr. JoAnne Pedro-Carroll explains with clarity and compassion in this powerful book, parents can positively alter the immediate and long-term effects of divorce on their children. The key is proven, emotionally intelligent parenting strategies that promote children's emotional health, resilience, and ability to lead satisfying lives. Filled with the voices and drawings of children and the stories of families, Putting Children First delivers a positive vision for a future of hope and healing. JoAnne Pedro-Carroll, is a clinical psychologist, researcher, consultant, and therapist. For twenty-five years, she was a senior researcher at the University of Rochester’s Children’s Institute and a member of the psychology and clinical psychiatry faculties. Dr. Pedro-Carroll founded and directed the Children of Divorce Intervention Program, and her work has earned numerous awards. Dr. Pedro-Carroll is an adviser to the Sesame Street Resilience Project’s Little Children, Big Challenges: Divorce and Separation. She has been married for thirty years, and is the mother of seven children and stepchildren. 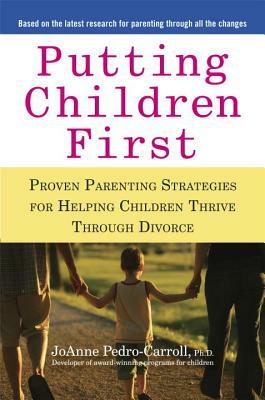 "I am proud to recommend Dr. JoAnne Pedro-Carroll's new book, Putting Children First: Proven Parenting Strategies for Helping Children Thrive Through Divorce. It is very readable, but incorporates a vast amount of research as well as the author's own extensive clinical experience. Today, when so many children suffer the problems created by their parent's divorce, parents and the professionals who work with them during the transitions relating to divorce will find this book a great guide to helping their children cope more successfully." "Putting Children First provides an abundance of useful information for parents who are divorced, thinking about divorce, or in the process of divorcing. JoAnne Pedro-Carroll is a highly respected psychologist, researcher, and developer of programs for children. She draws on scientific research as well as her own clinical experience to provide clear guidelines for parents based on the best available evidence about what works. I strongly recommend this book to parents as well as mental health and legal professionals who work with children from divorced families." "This book provides tremendously valuable insight and information about a child's thoughts and feelings and practical advice to parents, counselors and therapists dealing with the trauma accompanying divorce proceedings. Dr. Pedro- Carroll describes the fears and concerns of children and clearly articulates a sensitive way for parents to approach these issues so that families can move forward with their lives in a healthy way." -Judge Sondra Miller, Director, NYS Unified Court System Office of Matrimonial and Family Law, and former Justice, Appellate Division of the NYS Supreme Court. "By listening to children and combining a quarter-century of experience with the results of extensive research, Dr. Pedro-Carroll shares invaluable insights into the thoughts and feelings of children who experience what they often call "my divorce. "...The guidance offered by this book is unique because it is based on an exceptional knowledge of what goes on in the minds of children and because of the blended sensitivity and pragmatism of the author." "I have known JoAnne Pedro-Carroll personally and professionally for over 20 years. She clearly is one of the country's top divorce experts. She stands alone in her combination of ground breaking research, keen clinical insights, and unmatched sensitivity to children's struggles through divorce. Her reputation alone will garner great interest in the book. Her knowledge and emotional understanding will surely keep this book on the shelves of divorced parents, therapists, lawyers, and bookstores for years to come."